We welcome and celebrate the gifts of our gay brothers and sisters. The Welcoming LBGTQ Ministry is our outreach to the gay community. We want gay Catholics to feel welcomed and celebrated. St. Andrew Parish is a spiritual home for many gay Catholics who enjoy growing in their faith together and participating in the full life of the community. We believe that special attention needs to be given to our gay brothers and sisters who want to join or return to the church. We hold potlucks and other small gatherings. We also coordinate parishioners who wish to walk in gay pride parade. Please contact the Welcoming LBGTQ Ministry chair for more information. In 1996 the first Welcoming the Whole Family Committee was convened to serve the needs of St. Andrew parents of gay children and gay parishioners. Many GLBT people who grew up Catholic do not feel welcome in their Church, yet long for a way to return to their faith home. The ministry fit well with the parish’s focus on social justice and faith. Over the years, the Welcoming the Whole Family Committee has reached beyond our parish to serve the archdiocese by conducting workshops, hosting town meetings, and supporting Catholic parents of gay children. In 2000, we shared a booth at Portland Pride to reach out to disenfranchised Catholics so they could know where they were welcome to attend. 2001 was the first year we walked in the Pride Parade. We entered under the ecumenical umbrella of the Community of Welcoming Congregations. Since then, we frequently hear from gay and straight people how important this Catholic presence is in the parade. 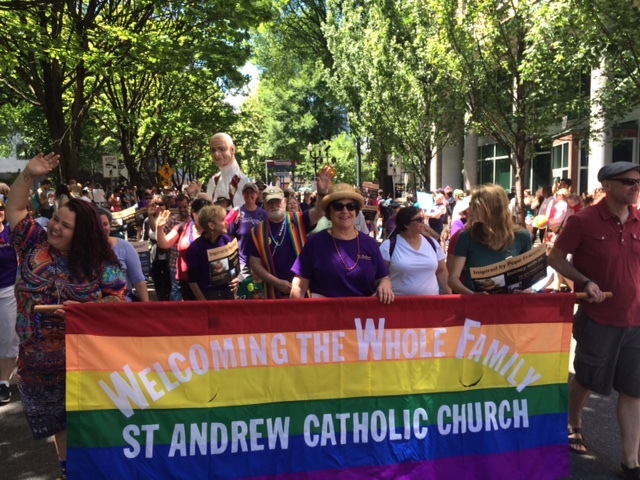 St. Andrew provided a personal and imminent invitation to return to the Catholic Church by extending a welcoming hand by participating in the Pride Parade. Our presence not only invites Catholics to come home, but has resulted in many people going through the RCIA to become Catholic at St. Andrew. St. Andrew is proud of its ministry to gay, lesbian, transgender, questioning and queer people. We welcome and reach out to these populations as well as provide information about issues to the parish. 1996: First monthly committee meetings convened. Sunday Forum: Straight from the Heart – panel discussion. Disseminated questionnaires about Welcoming Ministry to parishioners; compiled results. 1997: Convened Town Hall meeting for parish to discuss hopes and concerns of Welcoming Ministry. Held special “Listening Sessions” with parishioners who strongly objected to ministry. Ministry officially recognized by Father Bob Kruger and Pastoral Council. Informal support group for parents with gay children started by Steven and Florence Balog, who have lesbian daughters. Bulletin revised to include new statement. Convened the first meeting of Welcoming Parishes with representatives from St. Andrew, St. Philip Neri, Mission of the Atonement, St. Francis, and Downtown Chapel. 1999: Created a new St. Andrew brochure and Welcoming membership card. Hosted “Always Our Children: Lesbian and Gay Christians and Their Families” workshop facilitated by School Sister of Notre Dame Jeannine Gramick and Society of the Divine Savior Father Bob Nugent. Helped to organize St. Andrew Stewardship Fair with a booth for Welcoming the Whole Family Committee. Welcoming Committee contact names and contact information included on bulletin to make it easy to link up with this ministry. 2000: Shared a booth at Portland Pride with St. Philip Neri. Hosted “Jubilee: Global Justice and Reconciliation” facilitated by Bishop Thomas Gumbleton, retired auxiliary bishop from the archdiocese of Detroit, MI. 2001: Outreach efforts: include gay issues in prayers of the faithful and talk to other St. Andrews groups and ministries about welcoming strategies. First committee newsletter to include in bulletin and to pass out at Portland Pride. Father Kruger approved marching in Portland Pride parade. Marched in Portland Pride parade; parishioner Carol Bitz made banner. Diocesan Catholic Families Support group created by Steve and Florence Balog, with support of Archbishop Vlazny. Pastoral Council approves joining Oregon Community of Welcoming Congregations, a coalition of welcoming faith groups http://www.welcomingcongregations.org/. 2006: Convened Catholic Coalition meeting to expand efforts into other parishes. Goals: Outreach to other parishes and World AIDS Day service. Annual social activity rather than monthly meetings. 2009: Welcoming statement on Bulletin updated to include “gender expression”. Hosted social events to allow GLBTQ parishioners to get to know one another. 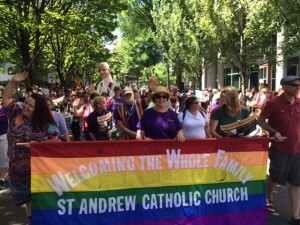 A large number of parishioners participate in Portland Pride parade.